An independent publisher has created their version of a rare book, distinctive for its stitched art and potentially a collectible with its limited production. 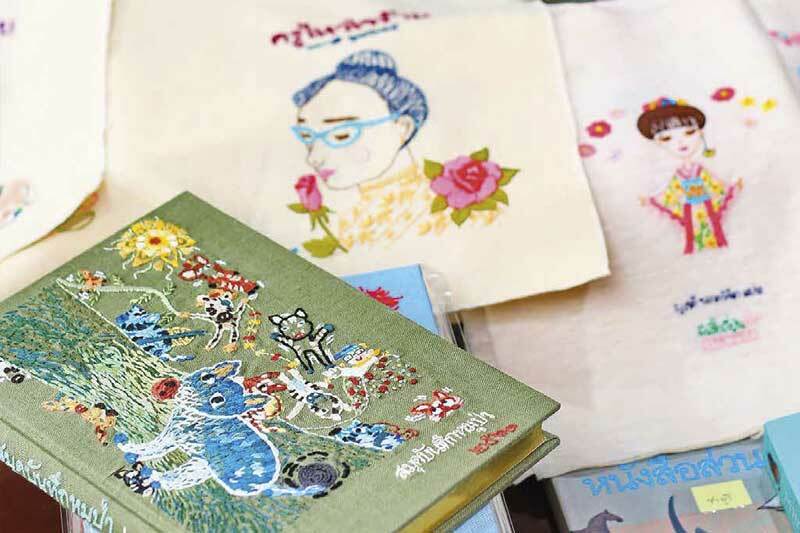 Meet one crafter of words and the community of needleworkers whose different sets of skilled hands ‘bound’ together a delightful Thai children’s classic. Today many people read – not a book – but a tablet, a smartphone and other electronic devices. A book, as we know, naturally loses its charm to digital media. Project Gutenberg, for example, has more than 22,000 e-books for free downloads. To survive the abrupt rise of the digital revolution, a publisher in Thailand did some novel magic to win a reader back to a bookstore. 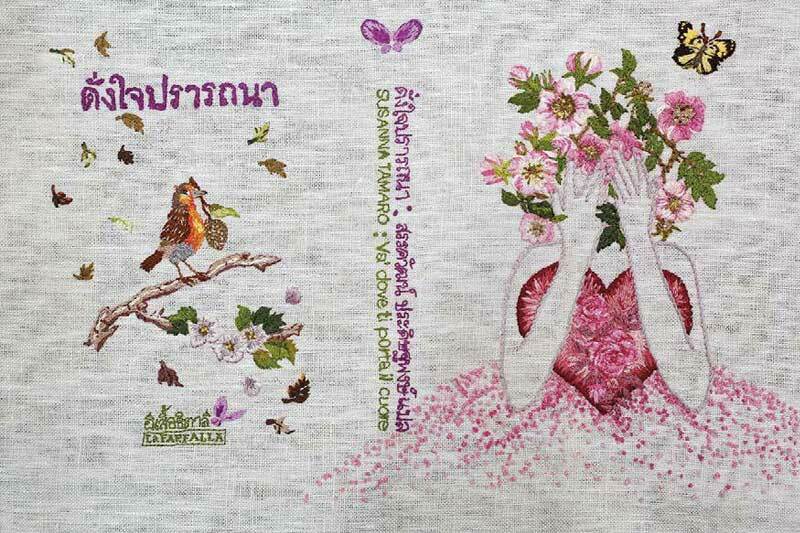 Butterfly Book, a small and independent publishing house, recently released a threaded cover edition of “Kru Wai Jai Rai (Mean Teacher Wai)”, a well-known children’s book, whose cover is one in needlework. Behind the decision is one of the publisher’s co-founders, Makut Onrudee. Makut is a respected author himself. 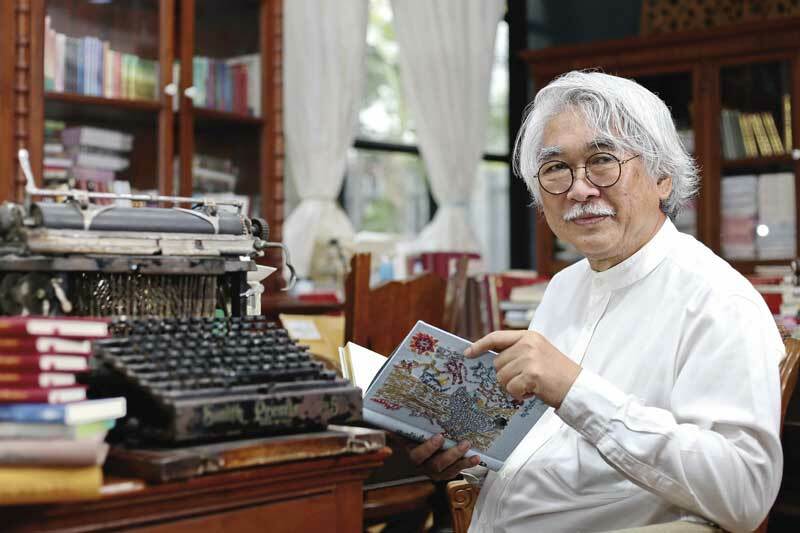 The 68-year-old Thai writer is noted for his acclaimed novel “Pheesua Lae Dokmai (Butterfly and Flowers)”. The story reveals a beautiful side despite the hard lives of children along Thailand’s southern frontier. To introduce Thai readers to world literature, Makut and his two friends established the small publishing house Butterfly Book. For decades, they translated and distributed children’s literature and classical novels (P.L. Travers’s “Mary Poppins”, Roald Dahl’s “George’s Marvellous Medicine”, Tetsuko Kuroyanagi’s “Totto-Chan: The Little Girl at the Window” and Andre Malraux’s “La Voie Royale,” to name a few) for Thai readers of all ages. Butterfly Book has always fascinated bibliophiles with their drop-dead gorgeous books, the type that readers crave to add to their collection. Their team spends considerable time editing manuscripts, designing charming covers and illustrations, not to mention using quality paper in their printing with durable book binding that can last for many years. This year, he came across Nopphakao Netbut, an independent female embroidery artist who wanders around with stitching needles and threads in Thailand’s Deep South to teach local people the art of ornamental needlework. That meeting re-ignited Makut’s passion for making an embroidered cover. The editor convinced the embroidery artist that with needles and pens, they can co-create new and potent art. The exquisite embroidery art could take the beautiful story of Kru Wai Jai Rai to the next level, and vice versa. “Nopphakao was interested in a threaded cover project, but she wasn’t sure how long it would take as embroidering was such a time-consuming process. She needs several weeks to complete a piece of embroidered cover. A hundred covers would take around two years,” said Makut. Creating the expected 500 pieces would surely take an eternity. And no one can wait that long. So the editor himself and the embroidery artist spread the news about their planned project to an embroidery community and asked if anyone would like to participate. The response was phenomenal as more than 200 embroiderers turn up. Butterfly Book then decided to crate its first embroidered cover bestselling novels written by another co-founder Phakawadee Uttamote. The book tells a story of an older female schoolteacher – infamous for her strictness and cold looks, making students and villagers in the small village nickname Kru Wai (Teacher Wai), as jai rai (mean in Thai). The idea of embroidering a book cover is not new but an ancient art. In the 17th and 18th centuries, the Europeans embroidered a Bible cover in cotton, silk and even gold threads. Needlework on a book is luxurious and the painstaking process of thought and work that must go into both aspects of embroidering and bookbinding. In 2011, Penguin Books (USA) commissioned artist Jillian Tamaki, an illustrator and comic artist (who also has a strong passion for embroidery), to create embroidered coves for three classic novels – “Black Beauty” by Anna Sewell, “The Secret Garden” by Frances Hodson Burnett and “Emma” by Jane Austen. Tamaki completed the three covers by hand over a two-month period before her original copies were reproduced through an innovative printing technique for final covers. The stitch – like book covers are spellbinding – but each book does not give a sense of originality as Butterfly Book does. 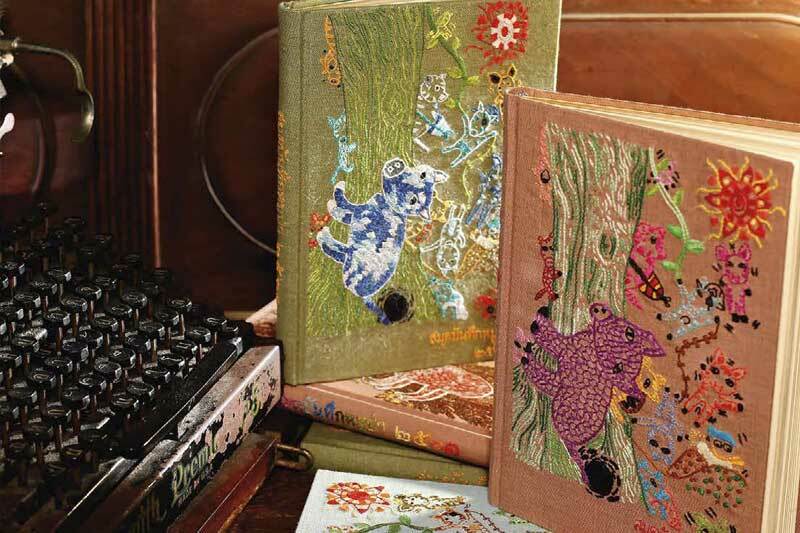 Their threaded series, on the other hand, offer original embroidery and needlework on every cover. “We print 500 copies, and each has its unique cover. Not one of those 500 covers are the same since they’re stitched by different embroiderers,” said Makut, illustrating his point as he showed five different stitched covers. “Before the project started, the local embroiderers had no idea about the story of the book they’re working on, because they don’t read a novel or anything [else]. Once the project carried on, they went through the story to find out who Teacher Wai is. 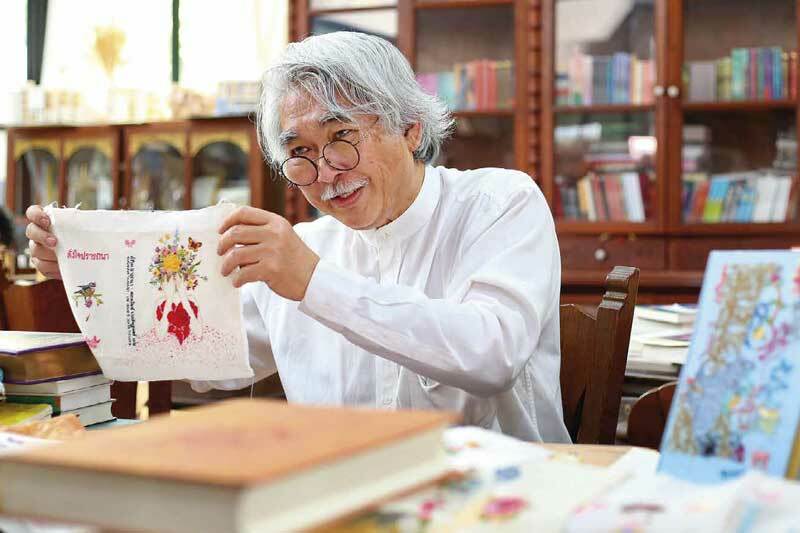 They then discussed the character and passed along the stories around their circle in their embroidery community,” related Makut, who has dedicated himself to promoting reading among Thais for decades. Already, Kru Wai Jai Rai with its stitched cover got more than 300 copies sold at the pre-order period. 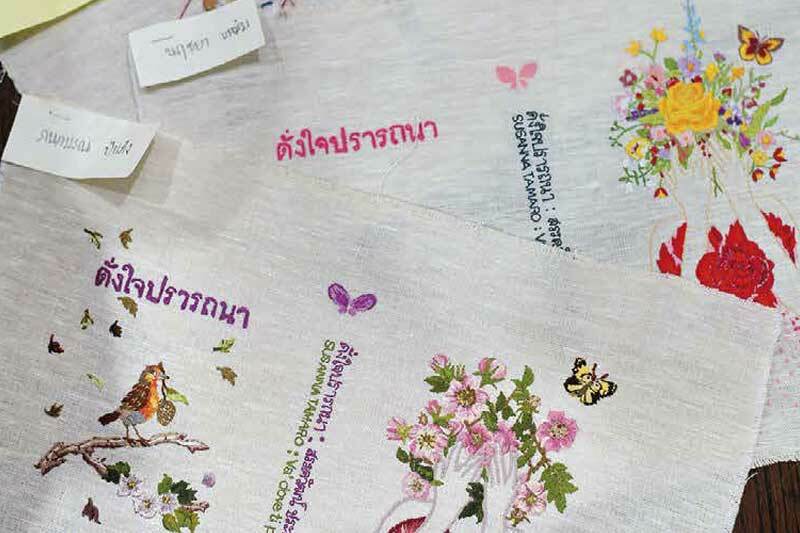 Butterfly Book plans to exhibit all 500 of the embroidered coves at the National Library of Thailand before the delivery of the luxurious edition to the bibliophiles.